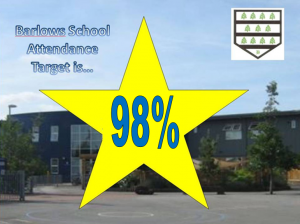 Every Tuesday there is a whole school assembly focussing on attendance. During this assembly the class with the highest percentage attendance for the previous week are awarded a trophy and a prize box which contains stickers and sweets for the children as well as CDs and a Nintendo Wii for the class to use for the rest of the week. Children who arrive on time for school are given a raffle ticket and enter into the Here On Time raffle. On Friday each class draws a raffle ticket and the winner recieves a prize. The School expects that all parents will support their children in being punctual and attending regularly. Any child who is absent without a valid reason is considered to be an unauthorised absentee. Parents are discouraged from taking their children on holiday in school time. If a term-time absence is unavoidable, it is essential that you fill in a holiday request form for your child’s absence to be considered for authorisation. If your child is in Year 2 or Year 6 please do not arrange holidays in the first half of the Summer Term (April and May) as the children will be involved in the national tests (SATs). Governors are keen to improve the level of pupil attendance and the headteacher provides a detailed analysis in his termly headteacher’s report to the Governing Body. The annual School Profile reports to parents on the level of unauthorised absences in the school.